"Not only do I believe that it is possible to maintain moral standards without the crutch of religion but I would argue that it is the only way to achieve true goodness." Disproving Christianity and Other Secular Writings compiles popular and lesser-known arguments against the principles established by the Christian canon. Using a phenomenological approach to build his case based on in-depth study at the University of California, Santa Barbara McAfee analyzes the Hebrew Scriptures and New Testament doctrine to build a logical and reasonable case against their validity. 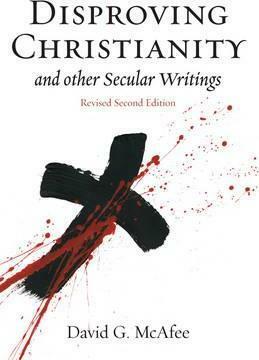 From contradictions between lived and portrayed religions to factual errors within the texts themselves, no stone is left unturned in this fully updated and expanded refutation of Christianity.